Matt Green scored twice as Mansfield recorded their biggest Nottinghamshire derby win against Notts County to keep their League Two play-off hopes alive. Green volleyed the Stags ahead from edge of the area, while Liam Noble sent Notts' best first-half chance wide. Adam Chapman doubled the advantage with a curled free-kick into the top corner before Green pounced on a Mike Edwards error to make it 3-0 soon after. Reggie Lambe added a third goal in 10 minutes and Mitchell Rose made it 5-0. 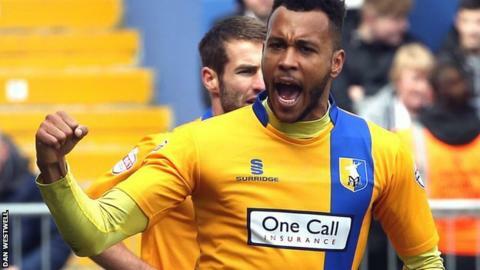 Mansfield's second league win over Notts this season sees the Stags move up to 12th in the table and and to within three points of the top six, with the rest of the day's League Two fixtures kicking off at 15:00 BST. Match ends, Mansfield Town 5, Notts County 0. Second Half ends, Mansfield Town 5, Notts County 0. Corner, Notts County. Conceded by Scott Shearer. Attempt saved. Liam Noble (Notts County) right footed shot from very close range is saved in the bottom right corner. Substitution, Mansfield Town. James Baxendale replaces Jack Thomas. Goal! Mansfield Town 5, Notts County 0. Mitch Rose (Mansfield Town) right footed shot from the centre of the box to the bottom right corner. Attempt saved. Matty Blair (Mansfield Town) right footed shot from long range on the left is saved in the bottom right corner. Corner, Notts County. Conceded by Matty Blair. Attempt missed. Wesley Atkinson (Notts County) right footed shot from outside the box is high and wide to the left. Attempt missed. Wesley Atkinson (Notts County) right footed shot from a difficult angle and long range on the right is just a bit too high. Stanley Aborah (Notts County) wins a free kick on the right wing. Substitution, Notts County. Mawouna Kodjo Amevor replaces Michael Edwards. Attempt blocked. Jack Thomas (Mansfield Town) right footed shot from a difficult angle and long range on the left is blocked. Goal! Mansfield Town 4, Notts County 0. Reggie Lambe (Mansfield Town) right footed shot from the centre of the box to the bottom left corner. Assisted by Matty Blair. Filip Valencic (Notts County) hits the bar with a left footed shot from long range on the left. Substitution, Notts County. Montel Gibson replaces Jon Stead. Attempt blocked. Wesley Atkinson (Notts County) right footed shot from outside the box is blocked. Goal! Mansfield Town 3, Notts County 0. Matt Green (Mansfield Town) right footed shot from the centre of the box to the bottom right corner. Attempt saved. Jon Stead (Notts County) left footed shot from outside the box is saved in the bottom left corner. Goal! Mansfield Town 2, Notts County 0. Adam Chapman (Mansfield Town) from a free kick with a right footed shot to the top right corner. Reggie Lambe (Mansfield Town) wins a free kick on the left wing. Foul by Wesley Atkinson (Notts County). Substitution, Mansfield Town. Mitch Rose replaces Emmanuel Dieseruvwe. Attempt saved. Matty Blair (Mansfield Town) right footed shot from outside the box is saved in the centre of the goal. Emmanuel Dieseruvwe (Mansfield Town) wins a free kick on the right wing. Second Half begins Mansfield Town 1, Notts County 0.